You might say--"About time" for a new posting. 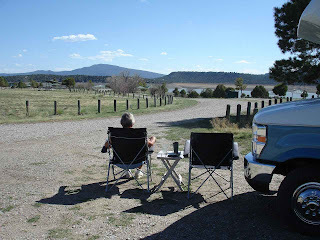 We have been without phone-and therefore -internet service for a while up here in north central New Mexico. 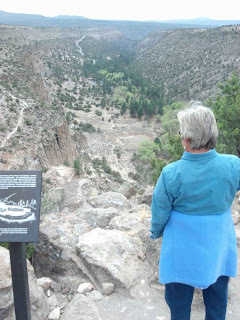 Wonderful visit to Bandelier National Monument -all about Ancestral Pueblo people from about 1200's to the mid 1500's. The remains are canyon floor rooms and cliff dwellings. They had a good visitor's center with all kinds of information. While we were there, there were at least 2 school groups being guided through. 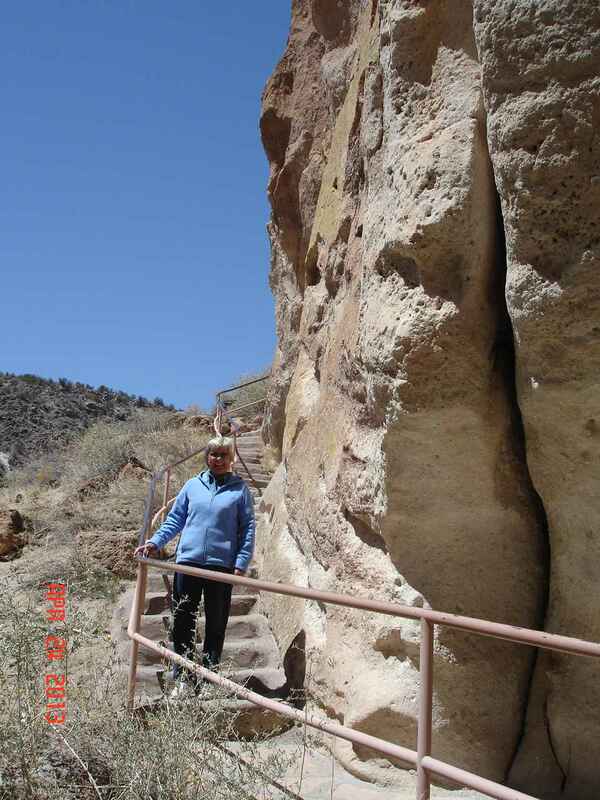 This is a picture form the canyon floor to some of the cliff dwellings. For perspective, you can see people on the path in front of the dwellings. A challenging walk, but not at all too difficult. There is a good walkway up and through the ruins. A handy railing for us old folks--though kids used them too!! You can climb up and into some of the dwellings. Inside, some had two or three rooms. The whole area is a canyon with a year round steady stream for fresh water. 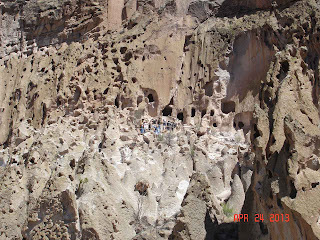 The dwellings are a result of volcanic ash from a long ago volcano. 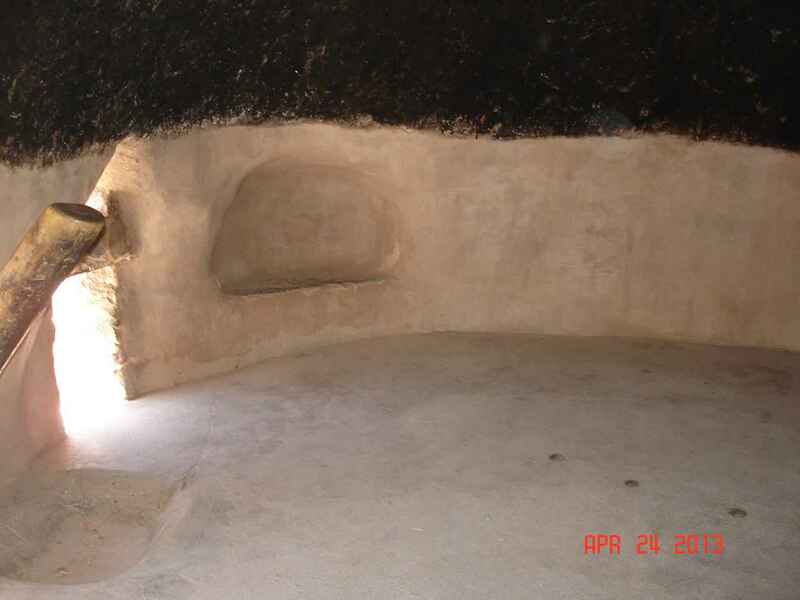 The rooms were fairly easily enlarged by the Indians with simple tools. Careful on that next step! From the walkway. 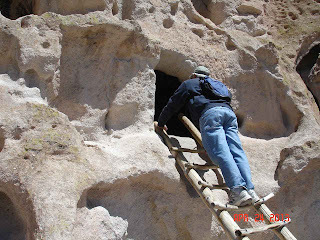 You can see one reconstructed house added to the cliff dwelling. 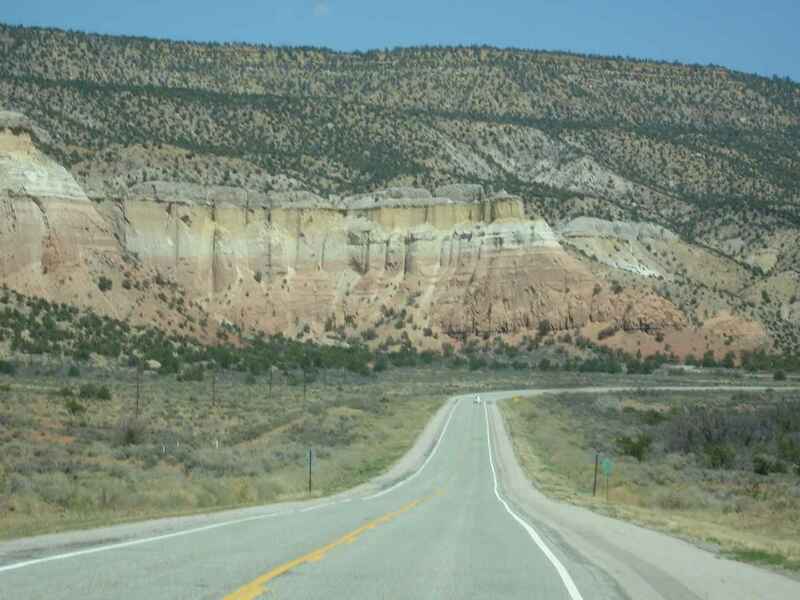 In the distance is the road down into the pueblo. The green trees mark the path of the stream. There was no road into Frijoles Canyon until mid 1930's. A lot of the development of this as a national monument was the result of the CCC. We have seen that Corps responsible for a large number of beautiful projects around the country. 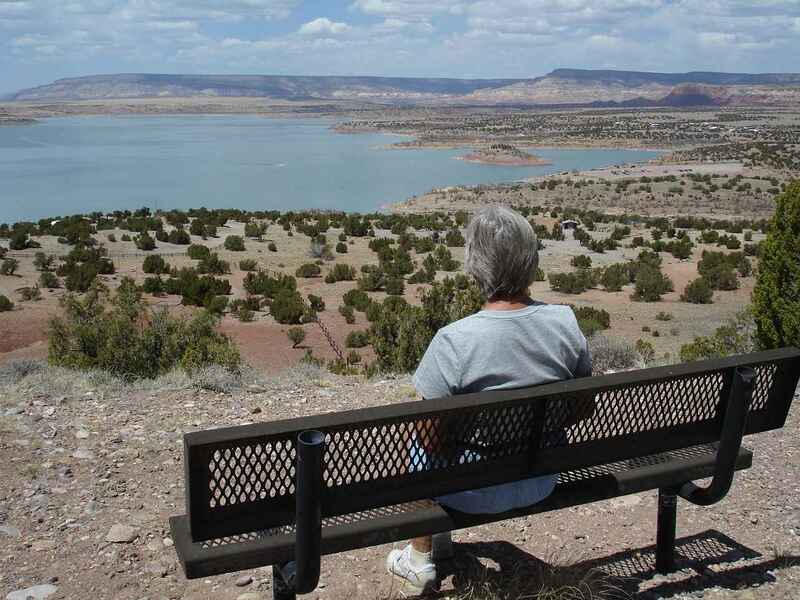 There are only 3 miles of paved road in the 33,750 acres of the monument. 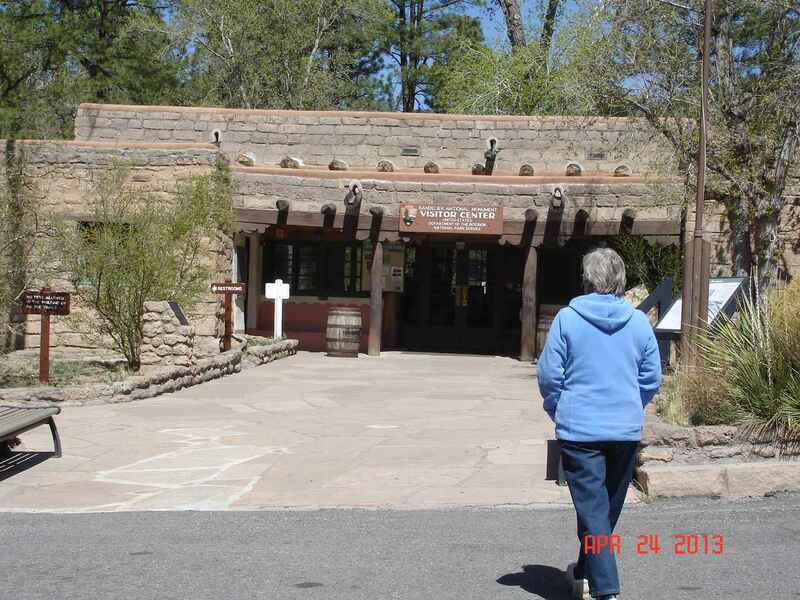 But there are 70 miles of hiking trails. The inside of this dwelling was spacious--over 3 feet taller than I am. The black is soot from fires which was also helpful in stabilizing the walls--no crumbling. 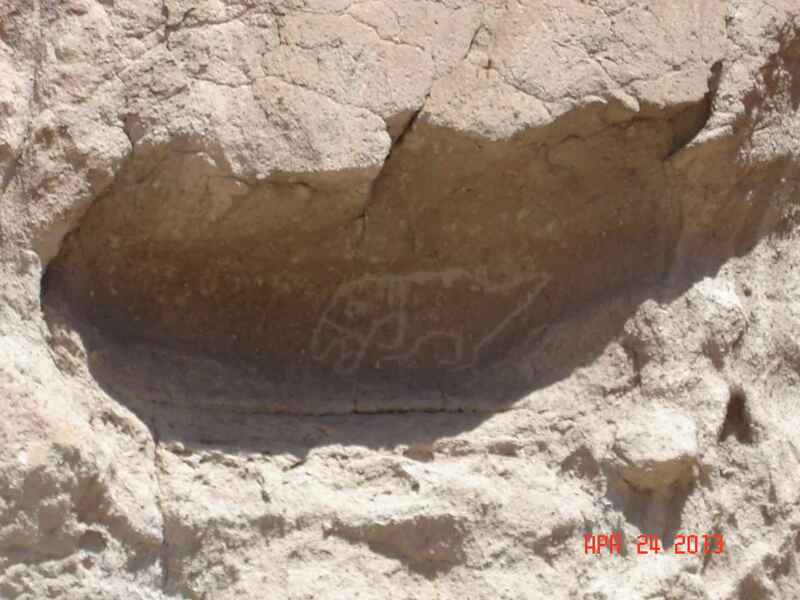 A number of petroglyphs( designs or symbols carved into the rock) are still visible. Usually they are above the dwellings--they would stand on the roofs to carve. This is of a macaw--a parrot type of bird from Central America. That seemed to be a result of the trade routes the Indians had established long ago. Should we leave them in the canyon? Guess we'll let them go. 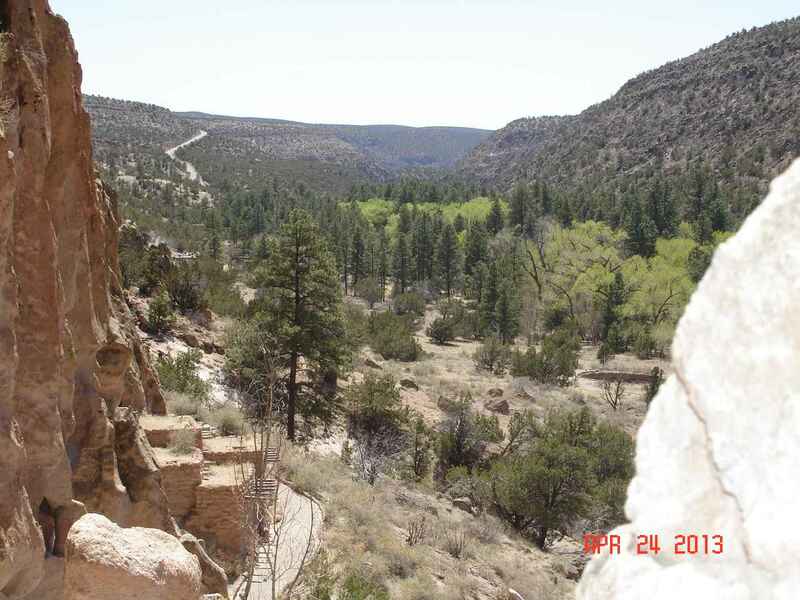 From a trail on top of the canyon. If you enlarge, you will see the tiny people 1,000 feet down at the ruins. There were also a few ruins up at this level. Some were for group or religious observances. Looking back the other way out of the canyon. Across the way you can one of the trails. Some of the roads were a challenge in our little motorhome. When you see a sign that indicates curve ahead 25 miles per hour, you go 20 miles per hour and hold on for dear life. We would not have done this in our larger 5th wheel. 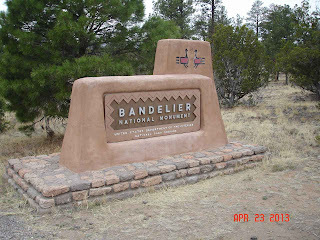 From Bandelier north to Abiquiu Corps of Engineer Park. 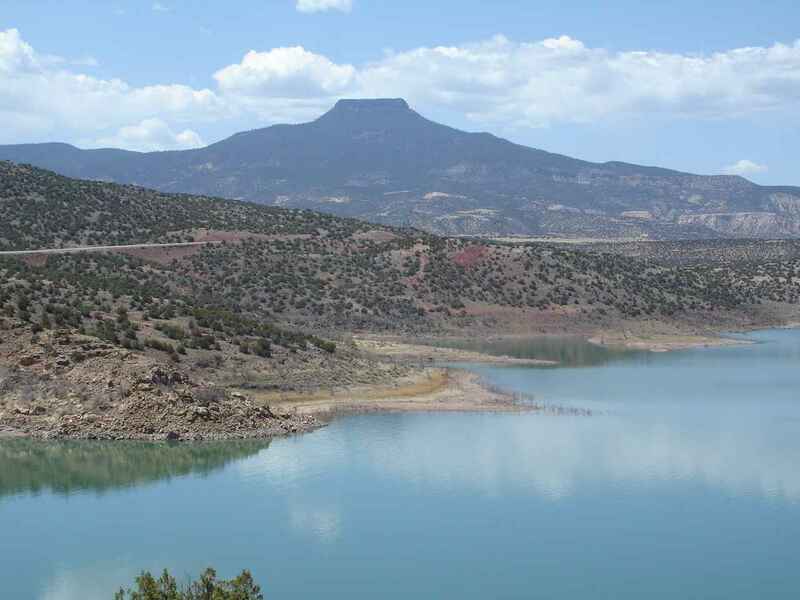 There are only two Corps parks in New Mexico. 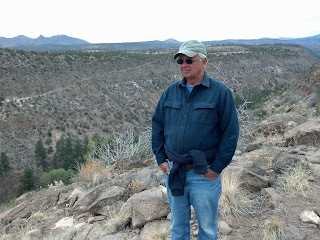 The other one was Cochiti. 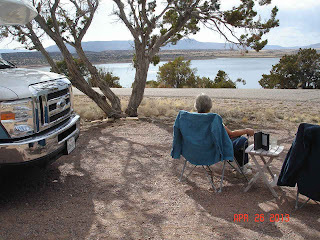 As usual, our old folks pass allowed us to be here for $6 per night--no hookups. 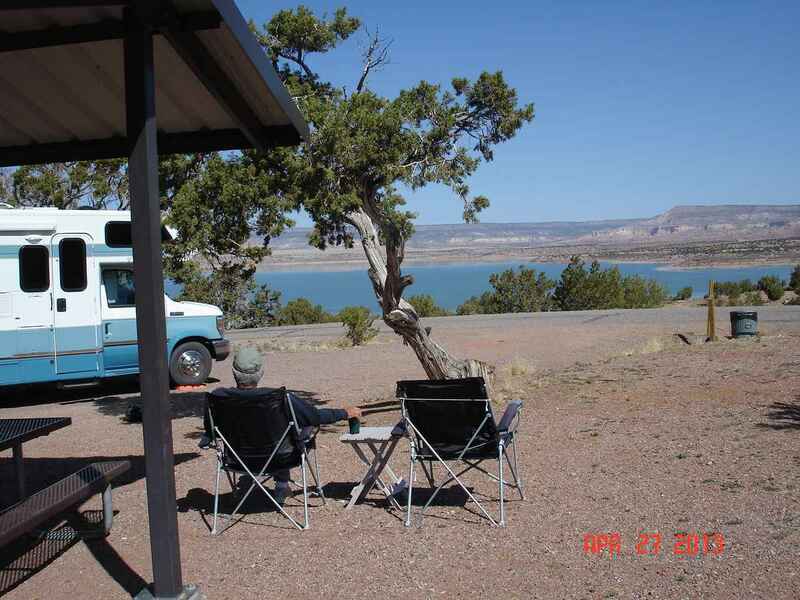 But since this was perhaps the best site, we took it knowing we were completely self contained and didn't need the water and electric hookups that everyone else wanted. Boy, these people love their coffee. Seems all they do is sit around, drink coffee, read their Kindles, and look at beautiful places. This is the Pedernal Mountain as seen from our campground. Also know as Flint mountain by the Indians because--they found flint there for their tools, weapons, and fire starter. This mountain was famous in Georgia O'Keefe paintings. 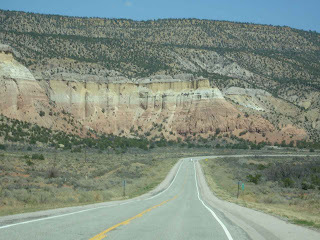 She stayed close by in Abiquiu town and at Ghost Ranch--a few miles up Route 84. From one of the hiking trails above Abiquiu. Can you find our Lazy Daze? It's the one closest to the water--center of picture. From one the highest points in the park--off towards the day use area and the boat launch area. 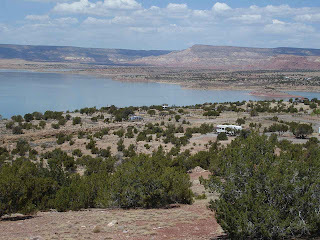 If the lake does not look large to you, please note that there are 3 boats in the lake --in front of Jan and towards this side of the lake. And----on our way up 84 to El Vado Lake State Park. This was typical of the views for most of the trip. 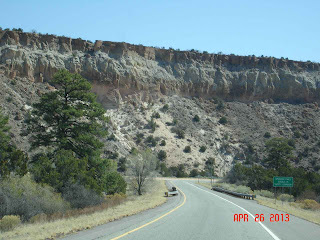 Cliffs can be white or red or layers of colors. As well as quite tall. Note the traffic. We may have seen all of ten cars for the entire 50 miles or so. El Vado is at 8,000 feet elevation. 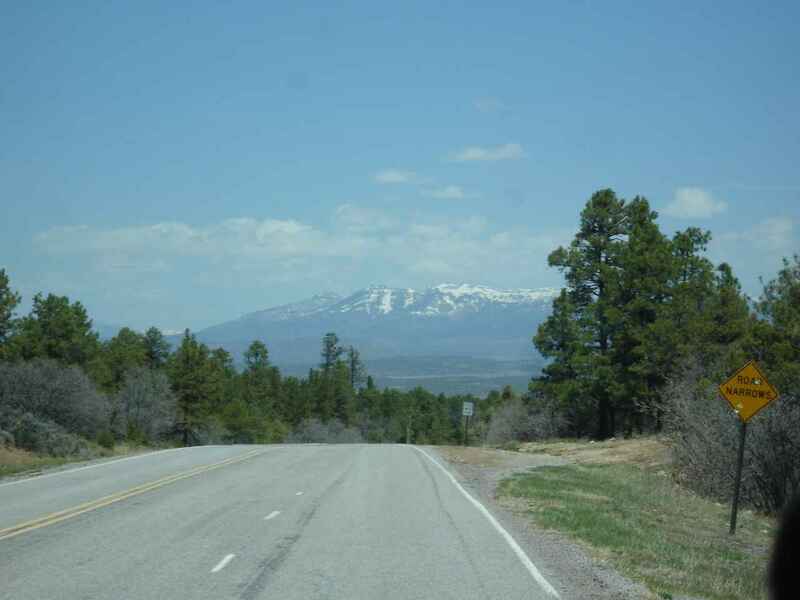 The surrounding mountains are 10,000 to 13,000 feet. Some are still skiing on April 29th. Yep, we're sitting again. Note all the congestion in the campground. There are only two sites being used right now--we are one of them. 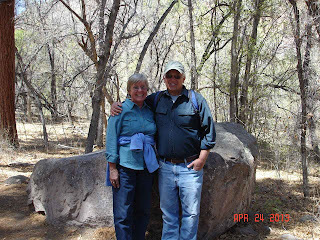 Actually, we have done a fair amount of hiking here. 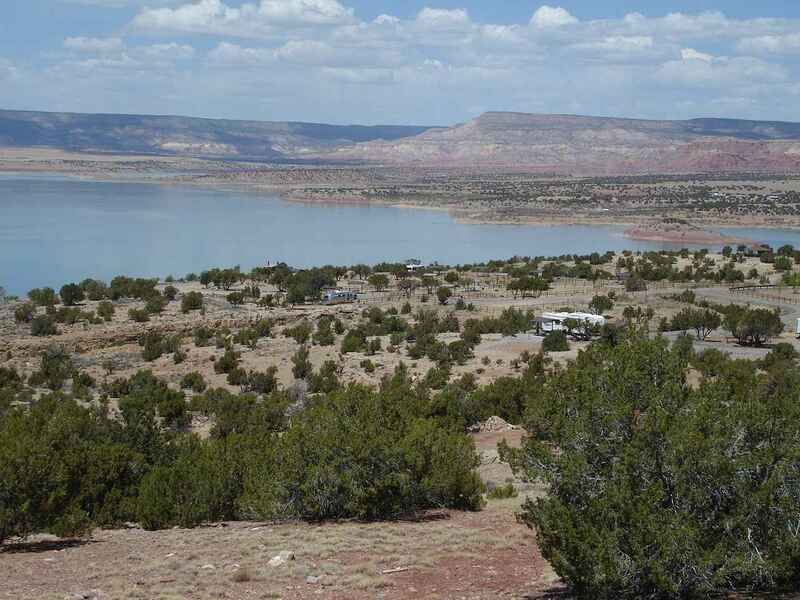 The 80 sites cover a huge amount of acreage. We did see 3 pairs of eagles nesting atop some electric poles. Also a number of deer and elk around, but we have only seen a few deer so far.